The Lightning and AMALIE Arena have selected Venuetize, a mobile technology company dramatically improving the customer experience at shopping, entertainment, and sports venues. The Venuetize platform will provide a turnkey mobile experience for guests attending live events through a new AMALIE Arena app. "Venuetize’s mobile platform will allow us to continue to move our operations into the digital world while also offering our fans added value and convenience right from their smartphones," said Sean Walker, VP, Innovation & Technology Services at the Tampa Bay Lightning and AMALIE Arena. Beginning today, Tampa Bay Lightning fans and other event goers visiting AMALIE Arena, will enjoy a new mobile experience that allows them to personalize their visit; pay for concessions and merchandise from their handheld device; and access a range of services that make planning and enhancing their experience at the arena much easier. The Lightning and AMALIE Arena have selected Venuetize, a mobile technology company dramatically improving the customer experience at shopping, entertainment, and sports venues. The Venuetize platform will provide a turnkey mobile experience for guests attending live events through a new AMALIE Arena app. 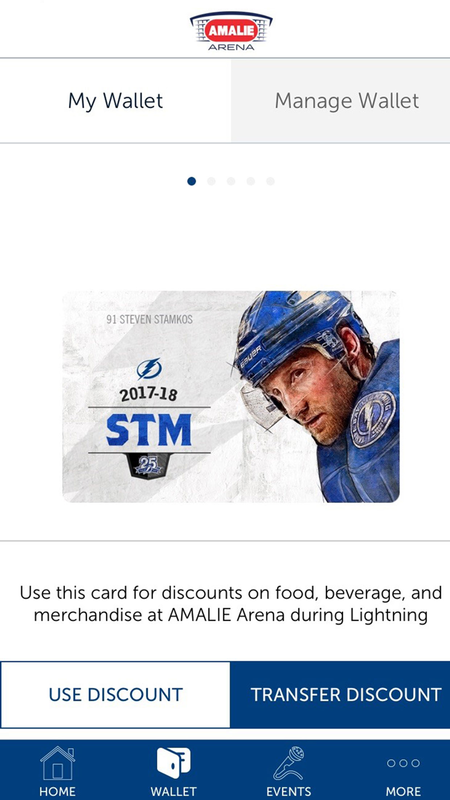 One of the key, innovative features in the AMALIE Arena app is a feature-rich mobile wallet, which not only enables guests to purchase concessions and merchandise from their smartphones, but also allows Lightning Season Ticket Members enjoy their discounts or even transfer their discounts to other guests when they forward their event tickets, all without the need to use or have to deliver a physical discount card. The new mobile experience also offers visitors to AMALIE Arena an overall enhanced driveway-to-driveway experience, delivering the capability to search for arena events by event type; purchase, use, and forward event tickets; and discover and purchase upgrades and experiences at the arena. The Lightning are among professional sports teams incorporating new technologies to engage with their fans in fresh and innovative ways that create a comprehensive approach to fan engagement. At the same time, the Lightning are leveraging Venuetize’s platform to pioneer creative and compelling use cases that incorporate their partners. The AMALIE Arena mobile app is now live in stores and is available for iOS and Android users. The Tampa Bay Lightning, as well as the leasehold rights to AMALIE Arena, were purchased by Jeff Vinik in March 2010. Vinik has executed a plan over the past seven years that has seen the organization go through a comprehensive brand transformation, while also making a significant positive impact in the Tampa Bay community. Since acquiring the Lightning, Vinik has made the organization a world-class franchise, created an unrivaled fan experience for guests of AMALIE Arena, and has put together a team of which Tampa Bay sports fans are proud of both on and off the ice.